The Tornado's Path - Part Four: "Being Human"
In the Batcave Jefferson Pierce, Hawkgirl, Wonder Woman and Batman stand around Trident as Superman attempts to remove the Starro from the villain's neck. Much to everyone's surprise the Starro breaks with an audible crack. Batman instructs Superman to hand the piece over, adding that he thinks they have a problem. 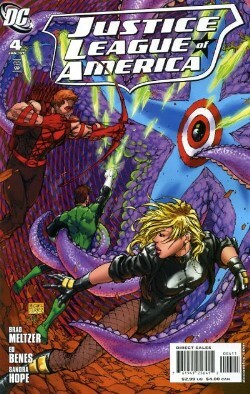 Meanwhile Green Lantern, Black Canary and Red Arrow launch an all-out assault on Ivo, Dr. Impossible, the Electrocutioner and Plastique after fighting the army of Tornado clones. They quickly discover that the villains have Starros on their necks and set about removing them. Black Canary questions Ivo about his involvement and the immortal explains that he wants to give up his spot as one of the thirteen immortals walking the Earth. Dr. Impossible breaks through one of Lantern's constructs and brags about his connection to the New Gods before Arrow takes out the Starro on his neck. Back at the Batcave Batman and Superman study the Starro and reveal that Ivo is responsible for the Starro but he had help. Hawkgirl asks what they plan to do about that and one look at the other heroes ready for action she instantly knows the answer. Green Lantern and Red Arrow reach what they think is Red Tornado and release it. The supposed android rises and the heroes see that it is Amazo's head on the Red Tornado's body. They have little time to react when Amazo attacks and escapes. Red Tornado arrives soon after and accuses Professor Ivo of stealing his body. The mystery villain comes out of the shadows and knocks the very human Tornado out with one solid punch. He corrects Tornado by telling him that what they took from him was what he had discarded; the shell that became a merger of Tornado's resilience and Amazo's strength. It was also meant to be the mystery villain's future body and protection that would ensure his everlasting life. Canary and Lantern recognize the newcomer immediately but he introduces himself as Solomon Grundy anyway, adding that he is sick and tired of dying. Story - 4: Solomon Grundy. I mean I had the Amazo thing figured out. Not that having figured that out was a spectacular achievement because it was pretty much spelled out in the past few issues. It wasn't so much a trail of breadcrumbs as a detailed set of directions. And while the Starro thing was a surprise it wasn't shocking because Starro was the villain from the Justice League's first appearance back in the "Brave and the Bold" #28. I thought it was rather nice that Meltzer had been putting some of the older Justice League villains into the story even though their forms and purpose had been altered. But Solomon Grundy? Nope, I didn't see that coming. This is, of course, one of the main reasons I liked it so much. I dig shock endings and you can't get much more shocking than Solomon Grundy all gussied up in a three-piece suit. The pacing of this story arc has been a little off in places but the mystery of who that figure in shadows was unfolding exactly as it should have. Three issues to get us all in a tizzy about who this villain could be and then in the fourth chapter Meltzer hits us with the revelation and still manages to give it a cliffhanger feel. It's nice to see my faith in Meltzer's writing ability has not been misplaced. The scenes in the Batcave made me a happy reader as well. There were some moments and bits of dialogue that appealed to the inner fan boy in me, like Jefferson Pierce saying that what he's uncovered will definitely end up with some fighting or that truly awesome bit where Kendra asks what are they going to do once they trace the signal to it's source and turns around to see the other heroes ready to get to business. The great thing about those bits was they weren't over the top and frankly after three issues of seeing Superman, Batman and Wonder Woman sitting around a table it was a nice change of pace. Green Lantern's narration regarding Roy was my only real problem this month. Over the past three chapters it was nice to "hear" the inner dialogue of the characters but it seemed a tad out of place here. Maybe it was too much. I can't quite put my finger on why I didn't care for it outside of thinking that maybe the time for the thoughts and feelings these characters have for each other had passed and now we need to get to the action but there was plenty of action so I shouldn't have anything to complain about. Oh well, I guess it's just one of those things. Despite being slightly late this issue was well worth the cover price. Meltzer is bringing the story along at a good clip and even gave us a taste of what is to come with the cameo by Geo-Force. Everything is coming to a head and it seems that within a chapter (or two) the League might be fully assembled. Art - 4: Ed Benes and Sandra Hope continued the solid work they have been doing for the past three issues. The two additions we got this month was one freaky looking Amazo and one suave looking Solomon Grundy. Amazo's first appearance was handled well. Benes and Hope gave us little glimpses of what he looked like before bathing him in shadow and the hitting us with the big reveal. I hope that when this book is put in a collected edition that they position it to where you have to turn the page to see Amazo's face. The fact that there were two ads before it in the actual comic worked out perfectly. Solomon Grundy's intro also played out well. Benes and Hope laid out a two page spread that had a fast paced sequence in the top four panels. Then, in the bottom six they slowed time down to the point where you actually felt the fist slam into Red Tornado's face and the confusion at seeing his own blood for the first time. This was followed by the "It can't be! Not him!" panel before seeing the stock broker version of Solomon Grundy. All of which is a complicated way of saying those two scenes were pretty freaking sweet. Cover Art A - 4: (Standard Cover by Michael Turner and Peter Steigerwald) I can't find much fault in this cover. Sure the Starro the heroes face on the inside was much smaller but the fact that this is a Michael Turner cover where characters are actually doing something is a nice change of pace. His covers for this series have been nice but pretty static over all. Here there is some action and it may sucker some old time readers into checking out the book if they have any particular feeling for Starro. Cover Art B - 4: (Alternate Cover by J.G. Jones & Alex Sinclair) Anyone besides me want to break into a chorus of, "The Circle of Life"? Ok, I'm not. Unlike last issue's variant I thought this was a decent cover. 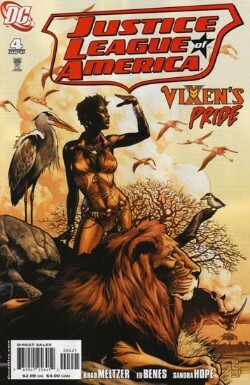 Vixen looks good. The animals look good. I even like the composition. Last month someone mentioned in the comments section that DC is probably putting out a series of character shots variants and it looks like they were right. Still, it's (say it with me now) not worth the ten to fifteen extra bucks it would take to buy it.